Collingwood coach Nathan Buckley confirmed Darcy Moore will miss Friday night's blockbuster Preliminary Final against Richmond. Darcy Moore continues to make good progress in his return from the hamstring injury that has kept him sidelined for the past six weeks. Collingwood’s tall utilities Ben Reid and Darcy Moore remain in contention to take on Greater Western Sydney on Saturday. The son of Collingwood great Peter arrived at the Magpies in 2015 after a superb year for the Oakleigh Chargers in the TAC Cup and Vic Metro in the National Under-18 Championships. Boasting excellent size (200cm), Moore showed potential at both ends of the ground in his debut year but cemented himself as a key forward of the future the following year. He kicked 24 goals in 2016, assuming the mantle of the club's go-to forward in the process. With Travis Cloke moving to the Whitten Oval, Moore's importance will only increase in the years to come. Many believed Moore would one day succeed Travis Cloke as the club’s prime mover in attack, but few would have imagined it would take place as soon as 2016. But Cloke’s fluctuating form and Moore’s incredible maturity meant he assumed the mantle early in his second season. He finished the year with 24 goals, including three hauls of three, and by the tail end of the year had begun to command greater attention from opposition defenders. His work against the Eagles in round 19 was particularly noteworthy, kicking three goals from six first half marks before sitting out the match with a hamstring complaint. He still earned a Rising Star nomination for his troubles, but would sit out two matches due to the injury before his year was out. Anticipation is a dangerous thing, and Darcy Moore had truckloads of it surrounding his every move in 2015. Rarely has an 18-year-old draftee landed at Collingwood with more hype than the versatile 199cm swingman. All the attention meant that there were plenty of eyes watching at Windy Hill when Moore clutched at his hamstring on the wing in just his second game in Collingwood colours. The injury kept him out of action for the best part of six weeks, but refused to define the father-son’s season. He returned to the VFL on a wet Saturday afternoon at Casey Fields and completed four games of varying intensity before finally realising his AFL dream in July. Moore immediately gave the football world a sample of what he can produce at both ends of the ground. 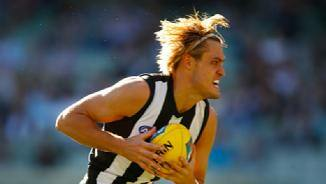 He played his debut as a forward before shifting to defence in Collingwood’s round 15 clash with Port Adelaide. However it was a return to the forward-line in his third game that Moore burst into stardom. With Travis Cloke missing with injury, Moore demanded attention with an impressive five goal performance. As the Magpies fell behind the Western Bulldogs, he kicked Collingwood’s only two goals in the third quarter, before adding his fourth in the final term. With six games remaining in the season, Moore would again show glimpses of what he will offer the Magpies in years to come. Against Sydney in round 20 he was unlucky to miss out on a NAB Rising Star nomination after a game which consisted of 15 disposals, seven marks and a goal. With just nine games under his belt in his debut year, the Rising Star is an award which Moore will not only be eligible for next year, he will more than likely be a frontrunner. Anticipation can be a dangerous thing, and Moore had truckloads of it surrounding his every move in 2015. Rarely has an 18-year-old draftee landed at Collingwood with more hype than the versatile 199cm swingman. All the attention meant that there were plenty of eyes watching at Windy Hill when Moore clutched at his hamstring on the wing in just his second game in Collingwood colours. The injury kept him out of action for the best part of six weeks, but refused to define the father-son’s season. He returned to the VFL on a wet Saturday afternoon at Casey Fields and completed four games of varying intensity before finally realising his AFL dream in July. Moore immediately gave the football world a sample of what he can produce at both ends of the ground. He played his debut as a forward before shifting to defence in Collingwood’s round 15 clash with Port Adelaide, though it was a return to the forward line in his third game that saw Moore burst into stardom. 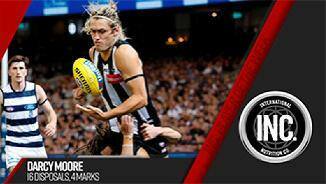 With Travis Cloke missing with injury, Moore demanded attention with an impressive five goal performance. As the Magpies fell behind the Western Bulldogs, he kicked Collingwood’s only two goals in the third quarter, before adding his fourth in the final term. 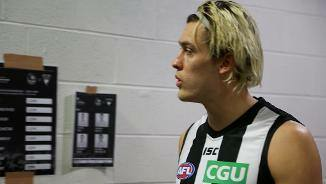 With six games remaining in the season, Moore would again show glimpses of what he will offer the Magpies in years to come. Against Sydney in round 20 he was unlucky to miss out on an AFL Rising Star nomination after a game which consisted of 15 disposals, seven marks and a goal. With just nine games under his belt in his debut year, the Rising Star is an award that Moore will not only be eligible for in 2016, but he will more than likely be a frontrunner when the experts cast their votes at season's end. 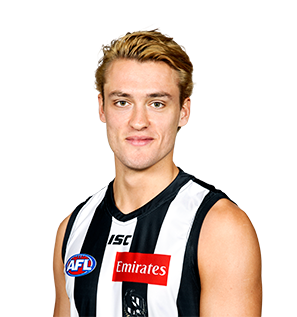 The son of Collingwood great and two-time Brownlow Medallist Peter Moore, Darcy could be developed at either end of the ground having excelled as a tall forward and key defender in 2014. Boasting excellent closing speed, a natural leap, strong marking ability over his head and smarts around goal, Moore stands at an imposing 199cm. He captained Oakleigh to a premiership over the Calder Cannons in the 2014 TAC Cup Grand Final and represented Vic Metro during the National U18 Championships. Moore has already enjoyed a taste of senior football, having made his VFL debut as Collingwood's 23rd man against Essendon late in the 2014 season.